Click here for the Annual Report of the United Nations High Commissioner for Human Rights on the situation of human rights in Colombia. The present report describes the human rights situation in Colombia in relation to peace, security, development and democracy in 2017. It also highlights some activities of the Office of the United Nations High Commissioner for Human Rights (OHCHR) in the country. In particular, the report presents the assessment by OHCHR of the first year of implementation of the human rights aspects of the peace agreement. It stresses the specific challenges in rural areas, including insecurity, violence linked to illicit economic activities in the context of disputes between illegal armed groups and organized crime, particularly in the areas of former Revolutionary Armed Forces of Colombia – People’s Army influence. The report also highlights the increasing attacks on human rights defenders, the impact of corruption on disparities in the enjoyment of economic, social and cultural rights, and the difficulties of addressing multi-dimensional, decades old problems suffered by the rural communities. The report includes 19 recommendations. 1. This Report is based on the monitoring of the human rights situation in Colombia by the Office of the United Nations High Commissioner for Human Rights (OHCHR) between 1 January and 31 December 2017. The Peace Agreement (the Agreement) between the Government of Colombia and the Revolutionary Armed Forces of Colombia – People´s Army (FARC-EP) assigned OHCHR in Colombia with substantial responsibilities1 – in addition to those included in its agreement with the Government of Colombia – without additional resources. 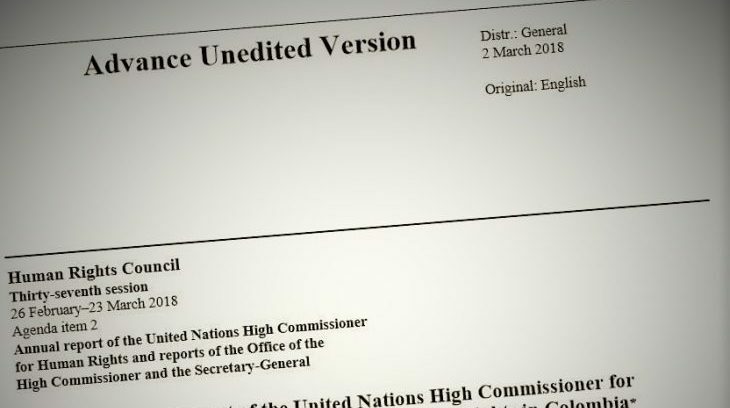 The parties requested OHCHR to include in its annual report to the Human Rights Council its findings on the human rights impact of the implementation of the Agreement. OHCHR monitors the impact of the Agreement in terms of the effective enjoyment of human rights by the people living in the areas most affected by the conflict. Such monitoring was conducted through 1,850 field missions in 2017. While negative effects were visible in the first year, positive transformations require more time, as resolving entangled problems that have prevailed for decades is a complex process. The Agreement allowed the end of hostilities between the parties. OHCHR recognizes the efforts of FARC-EP to comply with its commitments related to the demobilization and reintegration process, as well as the work of thousands of State agents to implement the Agreement. The Agreement reiterates pre-existing human rights obligations of the State. Its full implementation can greatly improve the human rights situation, especially in rural areas. There has been a high level of resistance to the implementation of the Agreement in various sectors of society, including among political and economic actors, the legislative and judicial bodies, as well as civil servants. For example, during the referendum process, the advancement of LGBTI and women’s rights within the Agreement were used to leverage opposition to the Agreement, which has had a chilling impact on previous gains related to these rights. OHCHR has observed that other armed groups, including the ELN, and criminal organizations have entered areas of former FARC-EP influence, often seeking to control illicit economies, negatively impacting the rights of civilians. The consolidation of armed groups and criminal organizations in these areas can substantially hamper the implementation of the Agreement and undermine potential human rights benefits of the peace process. Considering these movements, the window of opportunity for improvements in the human rights situation is short. OHCHR reaffirms his commitment to continue working with the State and civil society to facilitate improvements in the human rights situation in Colombia. Through its field presence in the areas most affected by the armed conflict, OHCHR contributes to positive human rights change by empowering rural communities; facilitating communityduty-bearer interaction; and building their capacity to respond to the rights of the community. The Agreement provides an additional tool to facilitate human rights change as much of it is designed to benefit rural communities through economic and political inclusion. OHCHR also promotes the participation of victims and the realization of their rights, for which the Agreement opens new possibilities and challenges. It also provides technical assistance and capacity building to facilitate the investigation and sanction of human rights violations.